18. mai / The Tartu City Government recognised the tender submitted by Canadian company Bewegen Technologies Inc, at a cost of EUR 2,608,077, as being successful in the public procurement for Tartu’s bicycle sharing system. In addition, the tender submitted by Terasteenus OÜ, in the amount of EUR 218,400, in the design and construction of the bicycle sharing system’s parking areas and their foundations, was declared successful. 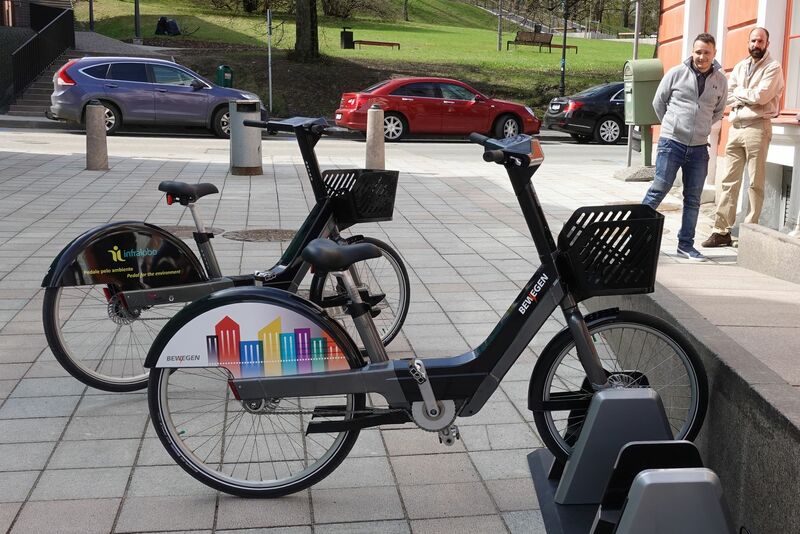 The public procurement was used to find a contractor that would supply the city with bicycles, docks, exterior information boards and a software solution for administering the bicycle sharing system. The equipment being delivered must be vandal-proof, user-friendly, and function as intended in Estonia’s climatic conditions (excluding the charging of electric bicycles, the working temperature of which falls within the range of -3 to +40 °C), and must have a guarantee of 5 years. Based on the plans, the bicycle sharing system will remain open year-round using standard bicycles (electric bicycles will be removed from circulation and placed into storage if the temperature drops below -3 °C). Standard bicycles must be easy to reconfigure into electric bicycles (should such a desire and need arise) and vice versa. Bicycle parking areas must be comprised of modules (4–5 docks per module), in order to ensure flexibility in the construction and relocation of the parking areas. Software must include different modules (user, operator, technician, and owner), be at least in Estonian and English, and allow for the bicycle to be used with the Tartu bus card and mobile app. According to Deputy Mayor Raimond Tamm, bicycle sharing will become a part of Tartu’s public transportation system. ‘In the future, the electronic travel card will, based on the user's wishes, allow one to rent a bicycle or ride on an intra-urban bus. During the first stage a total of 600 bicycles (of which 400 are electric) are planned for the system, along with 60 bicycle parking areas located across the entire city,’ explained the Deputy Mayor. ‘Our goal is to have the bicycle sharing system completed and tested by the end of this year, with a full-scale launch by the spring of 2019, at the latest,’ added Tamm. Four companies submitted tenders to the public procurement, with the tenders submitted by Bewegen Technologies Inc (Canada) and Nextbike Gmbh (Germany) declared suitable. In order to make the necessary preparations for the bicycle sharing system, a contractor was also sought to construct the parking areas. The winner of the procurement, OÜ Terasteenused, is tasked with designing and building the foundations for bicycle parking areas to such a state of completion that the supplier will be able to install the parking equipment in the designated places. Construction works primarily cover those parking spaces where the parking areas are located on green areas. In all locations the contractor is also tasked with ensuring the readiness to complete an electrical connection. The construction of the bicycle sharing system is being financed from the city’s budget; the Tartu bike sharing project, which is being financed with EU structural funds, and the European Commission’s project SmartEnCity. Further information: Raimond Tamm, Deputy Mayor of Tartu, Tel: 515-4738.